Edelman considers primary consciousness from the perspective of neural darwinism, a concept that he developed as part of his more general theory of the selection of neuronal groups. According to this theory, two different evolutionary processes take place in our brains. The first occurs while the brain is still developing, when a Darwinian competition takes place among populations of neurons whose connections are only partly constrained by our genes. The second evolutionary process is a learning process that has similar mechanisms but that continues in a more moderate way throughout our lives. Through these two processes, the brain, which has an overabundance of neuronal connections at birth, ends up preserving only those that are sufficiently stimulated in the course of our lives. Edelman’s model is consistent with Libet’s experiments showing that even if a behavioural response occurs very rapidly after the thalamus is stimulated, the associated conscious experience takes about half a second to occur. According to Edelman and Tononi, this delay is due to the long “reentrant loops” that connect various distant areas in the brain and that must be “closed” for the conscious impression to arise. For Edelman, “reentrant loops” differ from what are generally called feedback loops. A feedback loop is a simple, well defined circuit in which the effects come back to act upon the causes—to correct errors, for example. In contrast, a reentrant loop develops in a system that has undergone a form of selection, and this loop follows multiple parallel pathways where the information is not determined in advance. Like a feedback loop, however, a reentrant loop can be either local (confined to a single neuronal map or neuronal assembly) or global (distributed across several entire areas of the brain). Most neurobiological models of consciousness focus on thalamocortical activity. But there is an alternative approach that instead assigns the fundamental role to the subcortical structures. Swedish neuroscientist Bjorn Merker, the most ardent champion of this alternative, points out that “to be conscious is not necessarily to be self-conscious”. Primary consciousness (or, in Panksepp’s terminology, “primary affect”) can be defined as the ability to integrate sensations from the environment with one’s personal objectives and emotions of the moment in order to guide one’s behaviour. And in Merker’s view, this primary consciousness, whose contents cannot be expressed verbally, is produced by the activity of cortical substructures. For example, Merker suggests that the superior colliculus, in addition to co-ordinating the movements of the eyes, to enabling us to pay attention to things, and to integrating information from various sensory modalities, may also generate a simulation of our sensory world—a simulation that corresponds to what is known as primary consciousness. The subcortical structures that interest Merker thus correspond to the upper part of the brainstem, which runs from the roof of the midbrain to the base of the diencephalon, as well as other subcortical structures such as the zona incerta, the ventral thalamus, and the diffuse neuromodulation systems of the brainstem. According to Merker, these subcortical structures integrate the information that is massively distributed in the cortex into the sequential, limited-capacity operating mode of these parts of the brainstem. And it is precisely this singular operating mode that would give primary consciousness the properties that we associate with it and that are necessary for choosing a single, coherent behaviour. These subcortical structures would thus act somewhat like a funnel that channels the myriad processes occurring in the cortex down into a single conscious process that is adapted for making decisions in real time in the real world. In this context, Merker believes that the tacit consensus that the cerebral cortex is the “organ of consciousness” may simply prove to be an error. Some authors have responded to this idea by stating that the cerebral cortex can be regarded more precisely as the “organ of conceptual consciousness and reasoning”, and that Merker’s observations on primary consciousness and subcortical structures do nothing to change that. Nevertheless, Merker’s observations, such as those regarding children with hydranencephaly, could have some very concrete implications. Hydranencephaly is the most severe developmental brain anomaly and is distinguished from hydrocephalus by the total absence of the cortex. For Merker, the fact that children with hydranencephaly smile and laugh in a way that is entirely human and different from other primates constitutes evidence that the brainstem is not just a reptilian relic lying forgotten in the sub-basements of the brain. 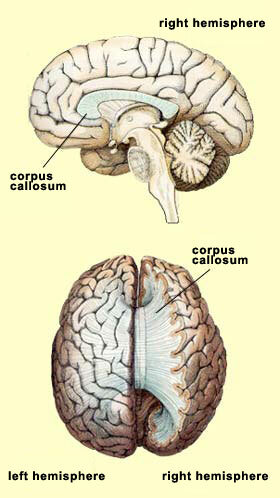 In Merker’s view, the human brainstem is specifically human. If Merker is correct, this would raise some serious questions about medical definitions of brain death that are based on the absence of cortical activity. At the very least, doctors could no longer assume that hydranencephalic patients do not need pain medication or anaesthesia during major surgery. In the final analysis, these observations suggest that some subcortical mechanisms play an important role in what is called the conscious state, and that no description of conscious phenomena can be complete if it is limited to the thalamocortical loops alone. Many authors believe that self-awareness, or the sense of self, is the product of evolutionary and cultural pressures, and thus not just of our physical environment but mainly of the other individuals with whom we communicate. Some authors therefore believe that human beings’ sense of self may have co-evolved with our language-related abilities to engage in abstract, symbolic thinking. For example, V.S. Ramachandran hypothesizes that a new set of brain structures evolved in the course of hominization in order to transform the outputs of the primary sensory areas into what he calls “metarepresentations”. In other words, instead of producing simple sensory representations, the brain began to create “representations of representations” that ultimately made symbolic thought possible, and this enhanced form made sensory information easier to manipulate, in particular for purposes of language. One of the brain structures involved in creating these metarepresentations would be the inferior parietal lobe, which is one of the youngest regions in the brain, in terms of evolution. 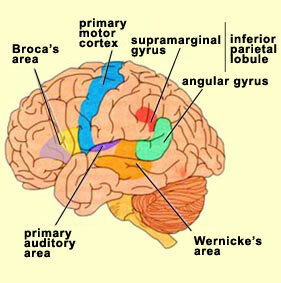 In humans, this lobe is divided into the angular gyrus and the supramarginal gyrus, and both of these structures are fairly large. Just beside them is Wernicke’s area, which is unique to human beings and is associated with understanding of language. 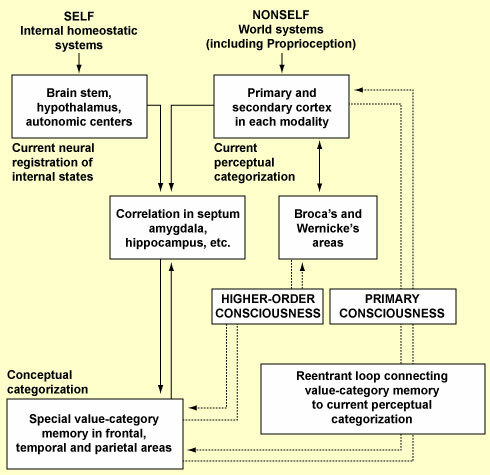 According to Ramachandran, the interaction among Wernicke’s area, the inferior parietal lobe (especially in the right hemisphere), and the anterior cingulate cortex is fundamental for generating metarepresentations from sensory representations, thus giving rise to qualia and to the sense of a “self” that experiences these qualia. The right hemisphere, because of its involvement in overall body image, is very important for generating this feeling of selfhood. But the left hemisphere, which is the one that specializes in language in the vast majority of people, seems to be just as essential, in its own way, for what we call self-awareness. After Hubel, D. (1988). Eye, Brain, and Vision. In any case, that is the conclusion suggested by experiments that have been conducted on people with split-brain syndrome. These people have had an operation in which the corpus callosum (a large bundle of nerve fibres connecting the two hemispheres of the brain) is completely sectioned in order to prevent epileptic seizures from propagating from one hemisphere to the other. After the operation, these people return to normal life. In their day-to-day activities, they show practically no apparent effects of having had their hemispheres separated. But under experimental conditions in which researchers present certain stimuli to only one of their two hemispheres, these people display certain disturbing dissociations. In fact, it seems that when someone’s brain is divided, their consciousness is divided as well! Michael Gazzaniga has demonstrated several situations in which the two cerebral hemispheres of people with split brains come into conflict (follow the Experiment Module link below for some examples). In general, if a visual stimulus is sent to a split-brain subject’s right hemisphere via the left eye, he will state that he has seen nothing. However, if you let him feel the object with his left hand, which also is controlled by the right hemisphere, he will then be able to select the object out of a group, but still won’t be able to state its name. It is as if there were two persons in the same individual: one who depends on the left hemisphere and can speak, and another who depends on the right hemisphere and cannot speak but can, if questioned correctly, prove that he or she has perceived something and act accordingly. When a person with a split brain is placed in a situation where the two hemispheres come into conflict, she may use her left hemisphere’s language capabilities to talk to herself, sometimes even going so far as to force the right hemisphere to obey the left hemisphere’s verbal commands. If that proves impossible, the left hemisphere will often rationalize or reinterpret the sequence of events so as to re-establish the impression that the person’s behaviour makes sense. It was this phenomenon that led Gazzaniga to propose that there is an “interpreter”, or “narrative self”, in the left frontal cortex not only of split-brain patients but also of all human beings. 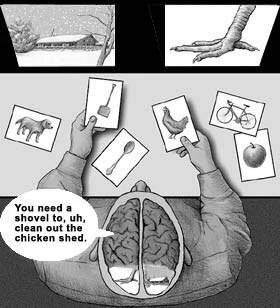 What a patient with a split brain answers when asked to explain why his left hand chose the picture of the shovel. This interpreter’s role would be to constantly tell us a coherent story that it constructs from our actions, emotions, and thoughts. In a sense, this interpreter would act as the “glue” that lets us assemble all the elements of our personal history and gives us the impression of being rational agents. In fact, according to Gazzaniga, the right hemisphere may also have its own interpreter. Even though it couldn’t speak, this observer in the right hemisphere would be better at understanding irony, jokes, and other emotional strategies. Each of these two interpreters would also control the voluntary movements of the limbs on the opposite side of the body. So does a person with a split brain have two consciousnesses? And does a person with a normal brain also have these two consciousnesses, except that they are so closely connected that they give us the impression of being just one? There is no consensus about whether we actually have an “interpreter”, a sort of inner observer, in our brains, and some authors, such as Daniel Dennett, have strongly criticized this idea. But one thing is certain: a great deal has been written about split-brain experiments in the past, and they will continue to generate much discussion in future. In any case, while some neurobiological models of consciousness focus on particular structures in the brain, such as the inferior parietal lobe, or on one particular hemisphere, other models flatly assert that consciousness cannot be attributed to any specific structure in the brain. In this regard, it should be noted that neuroscientists have often investigated the neurological bases of consciousness just as they would those of any other brain function: by analyzing the contribution of different parts of the brain or different groups of neurons. But many authors have criticized this conventional approach, arguing that it is not appropriate for studying so global a function as consciousness. They point out that damage to almost any part of the brain has an impact on consciousness, but that localized lesions, while affecting consciousness, will rarely destroy it completely. Another fact, emphasized by Gerald M. Edelman and Giulio Tononi, is that the circuits of the human brain are “massively degenerate”—that is, highly redundant, so that the same function can be performed by many different circuits. Edelman and Tononi thus belong to the school that believes that the brain as a whole has its role to play in conscious processes. Their model attempts to explain two characteristics of consciousness that they regard as fundamental: the fact that every state of consciousness is an indivisible whole, but that at any given time, every one of us can choose among countless different conscious states. In other words, their model attempts to account for both the unity and the complexity of consciousness. Like most neurobiologists who attempt to model consciousness, Edelman and Tononi find themselves forced to distinguish at least two major forms of consciousness: primary consciousness and higher-order consciousness. Primary consciousness, which we have in common with many other animals, is the kind that lets us become aware of the situation that we are in. It relies on the short-term memory that makes what Edelman calls the “remembered present” possible. In the Edelman/Tononi model, when a stimulus is received by the human brain, it forms perceptual maps composed of neuronal assemblies whose reciprocal connections are strengthened. The result is a system of “neuronal maps”, each of which is responsible for the brain’s various perceptual capabilities, which result from a selective process that Edelman calls “neuronal Darwinism” (see first sidebar). When the brain receives a new stimulus, several of these maps are activated and send signals to one another. Primary consciousness arises from the interaction of the various neuronal assemblies that code for the various properties of an object. This interaction would occur chiefly through reciprocal connections forming loops between groups of neurons that are sometimes quite distant from each other in the brain. Thus, in this model, primary consciousness constantly depends on parallel, recursive activity within and between areas of the thalamus and the cortex. Though Edelman and Tononi try not to draw too close an association between certain brain structures and conscious states, they do recognize the undeniable importance of the thalamocortical loops in the emergence of consciousness. They accord less importance, however, to neuronal synchronization as such than they do to the functional significance of these loops. According to this model, the other form of consciousness—higher-order consciousness, which emerged during hominization—also depends on such “reentrant loops” between neuronal assemblies, but in this case the loops make larger-scale connections in the brain, especially between the cortical areas associated with language and those associated with abstract concepts. The resulting massive increase in the brain’s semantic capabilities over the course of evolution enabled the concept of self to emerge, and hence enabled the brain to consider primary consciousness in light of the past and the future. In other words, it enabled the emergence of a consciousness of being conscious, which is the definition of higher-order consciousness. More specifically, according to Edelman and Tononi, all of this was made possible by the development of a “dynamic core”—a vast assembly of neurons that are constantly being rearranged, but that maintain continuity and generate an integrated picture from a complex range of possibilities, which are the two main characteristics of consciousness that this model seeks to explain. In other words, the dynamic core explains how consciousness can have only one object at any given time, but can move very quickly from one object to another. Just like Llinás and Freeman, Edelman and Tononi thus emphasize the dynamic aspect of this core, which here refers not to a stable anatomical structure but rather to an ephemeral pattern of activity involving neurons from different parts of the cortex at any given time. And because at any given time, the dynamic core can involve completely different parts of the brain, this model avoids the need to identify a particular area of the brain, or a particular type of neuron, or a particular frequency of neuronal activity as the source of consciousness. Instead, this model proposes that a given neuronal activity is part of a conscious state if, at the time that this state is conscious, this activity is included in the dynamic core. 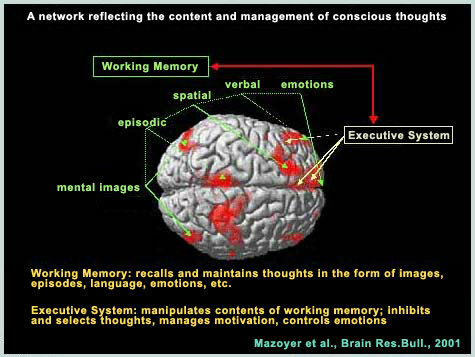 This model thus has a great deal in common with the global workspace theories of consciousness. It differs from them in that it does not say that a piece of content becomes conscious simply because it is made available to the rest of the system. In other words, the dynamic core model does not equate accessibility with consciousness the way that global workspace theories do. Although the neurons in this dynamic system interact mainly with one another, they also influence and are influenced by other structures in the brain. Indeed, even though Edelman and Tononi, unlike some other authors, do not attempt to give certain areas of the brain a “starring role” in their model of consciousness, they do identify several brain structures as playing an important part in it. Two of these structures, of course, are the thalamus and the cortex, which are involved in the formation of the reentrant loops. But an important role is also played by the nuclei of the brainstem, whose axons ascend into vast areas of the brain and diffusely release neurotransmitters such as norepinephrine, serotonin, acetylcholine, and dopamine. The activation threshold of the various neuronal assemblies in the cortex is then determined by these diffuse neuromodulatory systems (or, in Edelman’s terminology, “diffuse ascending value systems”). Some neurons in these neuromodulating nuclei will, for example, be in tonic activity when an individual is awake, and the cessation of this activity will help the individual to fall asleep. Other neurons will go into phasic activity when something new or important for the individual appears in the environment. For example, the neurons of the locus coeruleus release bursts of neuromodulators into most of the structures in the brain; when an individual enters a new environment, or something unusual happens in his or her surroundings, the neuromodulator released is norepinephrine. These neuromodulators can thus modify the activity of large populations of neurons. They can also change the likelihood that synapses will be strengthened or weakened in response to a given neuronal activity. These systems of neuromodulators are thus extremely well suited for amplifying one type of brain activity at the expense of another. Lastly, the ability to choose, from among numerous inputs, those that have a certain importance in the individual’s personal history affords a definite adaptive advantage. The hippocampus, which co-evolved with the cortex and interacts with it to produce episodic memory, probably plays a key role in this process. French neuroscientist Bernard Mazoyer and his colleagues performed a meta-analysis of several brain-imaging experiments in which the subjects’ brain activity while they were performing various specified tasks was compared with their brain activity while they were in a conscious resting state. When the researchers looked for commonalities in the images of this resting state from the various experiments, they discovered a network of brain areas that are activated jointly during this state. These areas include the two angular gyri, the left anterior precuneus, the posterior cingulate cortex, the left medial frontal cortex, the anterior cingulate cortex, the medial frontal sulcus, the left superior sulcus, and the left inferior frontal cortex. These results suggest that brain activity during the conscious resting state depends on a large-scale network of associative parietal and frontal areas of the cortex. The authors of this study also suggest that these areas may be organized around two major functional axes: a parieto-frontal network that is involved in episodic working memory and driven in part by emotions, and an executive system that is located in the left prefrontal lobe and supervises this parieto-frontal network.